The weather this past week was such a tease. Several days of warm-enough-for-just-a-sweatshirt, and now we’re back to endless cold and snow. Granted, we’re fairing better than a lot of the country, but I’m still bitter. I’m ready for spring. Until it gets here, I’m going to be all about comfort food. This dish is a fusion of two of our favorites – Tex-Mex and Italian. 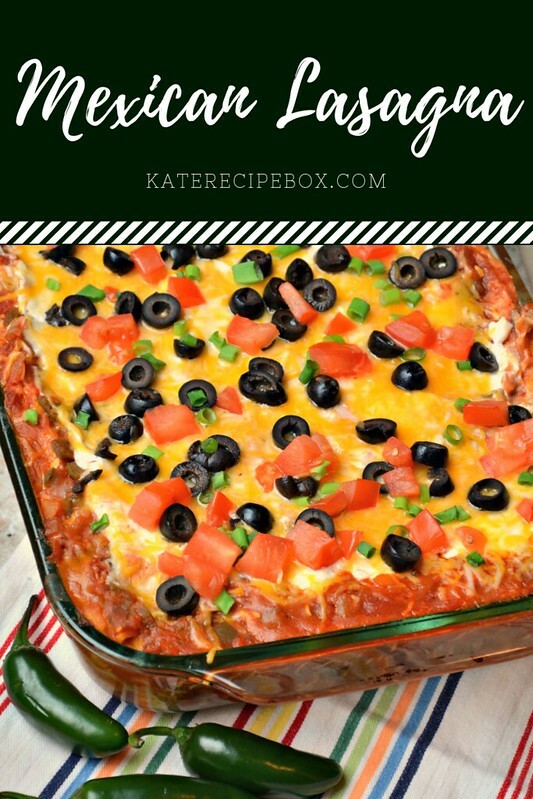 Lasagna is layered with taco meat, refried beans, and cheese, then topped off with your favorite taco toppings. I swear the kids will eat anything involving pasta or tacos, so this was a slam dunk for the whole family. The bake time on this is long – nearly two hours from the time you pop it in until the time it’s ready to cut – so this is perfect for a lazy day at home. I prepped this in the early afternoon and then popped it in to cook as we watched a movie. Today I’m linking up with the From Our Dinner Table bloggers to bring you lots of comforting casseroles for these chilly remaining winter days. We share Recipes From Our Dinner Table! Join our group and share your recipes, too! While you’re at it, join our Pinterest board, too! In a large skillet, brown the ground beef and drain the grease. Stir in the refried beans, chilies, taco seasoning and 1/4 cup salsa. Heat through. Spray a 9×13″ pan with nonstick spray. Spread 1 cup of the beef mixture on the bottom of the pan. Layer lasagna noodles on top, followed by 1/3 of the remaining beef mixture, and 1 cup of cheese. Repeat these layers two more times. In a large bowl, mix together the remaining salsa and water. Carefully pour over the lasagna, making the liquid as evenly distributed as possible. Cover with foil and bake for 90 minutes, or until the pasta is tender. Remove the lasagna from the oven, uncover, and spread the sour cream evenly over. Sprinkle with remaining cheese, olives, green onions, and tomatoes. Return to the oven and bake until the cheese is melted, about 10 minutes. Remove from the oven and let stand for 10-15 minutes before cutting. I think we all were thinking Mexican this week. Like this one as a weekday meal! What a gorgeous and hearty lasagne. Love the ingredients in this. I bet this makes amazing leftovers too. I love that you used lasagna noodles! I’ll have definitely have to put this on the menu. This total lasagna hoor has to try it! I love how thick this is and that it uses refried beans! Can’t wait to try it! I love fun recipes like this. It looks absolutely delicious! 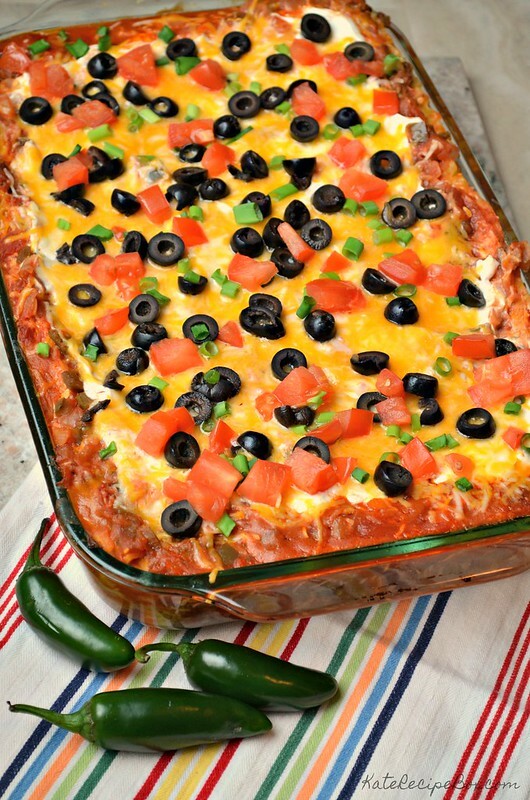 Oh I love mexican stuffed shells but I have yet to try making mexican lasagna. I am sure it’s just as good! Perfect for pasta or Mexican night! This is genius! What a delicious combination of flavors. It sounds like the perfect Sunday supper.